Article 370 has been a talking point since it came into force. Since the current BJP government came to power, the Article 370 debate has often been at the forefront of political discourse in India. This article does not intend to go into the technicalities of Article 370. Even the political churning between the Left, Right and the Centre around Article 370 has become cliched now. What this piece does is take a glance at the significance of Article 370, which may help us gauge the political narrative built around it across the political spectrum. 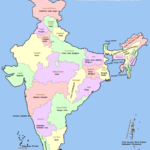 Included in the Indian Constitution on October 17, 1949, Article 370 exempts Jammu & Kashmir (J&K) from the ambit of Indian Constitution (except Article 1 and Article 370 itself) and permits the state to draft its own Constitution. 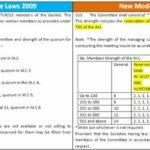 It restricts Parliament’s legislative powers in respect of J&K. 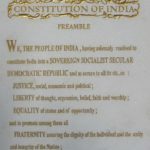 Earlier, the Instrument of Accession (IoA) came into play when the Indian Independence Act, 1947, divided British India into India and Pakistan. For the 565 princely states whose sovereignty was restored on Independence, the Act provided three options: to remain an independent country, join the Dominion of India, or join the Dominion of Pakistan — and this joining with either of the two countries was to be through an IoA. Powers relating to Foreign Affairs, Defence, and Communication remained with the Union of India. 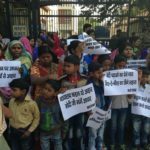 Laws on other matters enacted by India’s Parliament, however, require ratification by the state’s own legislature. Article 35A gives further immunity by mandating that no act passed by the J&K legislature can be challenged for violating the Indian Constitution or other laws passed by India’s Parliament. N. Gopalaswami Ayyangar, one-time Prime Minister of Kashmir and the chief drafter of Article 370, saw it as a temporary and interim arrangement. While the judgment in Kesavananda Bharati directed that any amendment to the Constitution could be tested for potentially violating the basic structure of the Constitution, Articles 370 & 35A were passed before the judgment and thus cannot be challenged on this based. The only body with powers to dissolve Article 370 was the Constituent Assembly of J&K which was however dissolved in 1955 without making any recommendations on Article 370. “We have fought the good fight about Kashmir on the field of battle… (and) …in many a chancellery of the world and in the United Nations, but, above all, we have fought this fight in the hearts and minds of men and women of that State of Jammu and Kashmir.” Nehru said in the Lok Sabha on June 26 and August 7, 1952. Let’s now turn to the views of the chief architect of the Constitution of India, Dr. B.R. Ambedkar, on this subject. 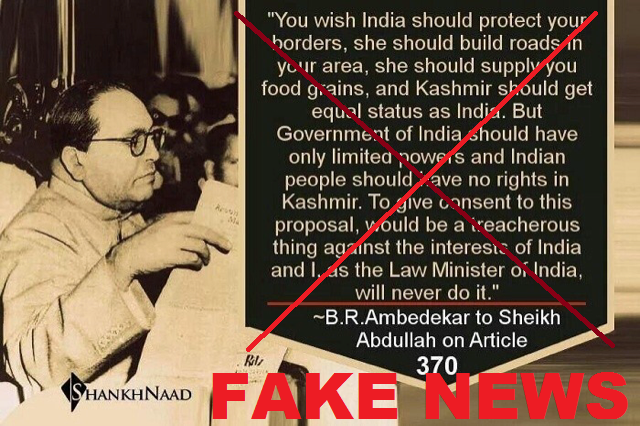 Every time Kashmir is in the news, a viral message regarding Ambedkar’s views is widely shared on social media. This quote of Ambedkar has been used by Subramanian Swamy, Sushil Pandit, and many other right wing leaders at almost every forum related to Kashmir issues. Various columns in famous publications like India today, Daily Pioneer, The Hindu, Employment News, Indian Defence review, Law corner, DailyO and more have carried this quote of Ambedkar. “You wish India should protect your border, she should built roads in your areas, she should supply you food, grains and Kashmir should get equal status as India. But government of India should have only limited powers and Indian people should have no right in Kashmir. To give consent in your proposal, would be treacherous thing against the interest of India and I, as a Law Minister of India, will never do.”. Also innumerable messages in marathi talkabout Dr. Ambedkar advising to send Mahar battalion, and also he explained that guerrilla tactics to be applied. During the series of lectures organised on behalf of New India Debate Society for over three years on Ambedkar writings, we researched through all of the written literature of Ambedkar. Specifically, his writings and speeches on Pakistan and the Partition of India, Consituent Assembly debates, etc. contained no authenticated writing on Article 370, nor did any document from his exhaustive literature. Interestingly, the earliest “refusal to draft” statement can be found in an editorial in Tarun Bharat, an RSS mouthpiece, dated 1991 citing the verbal account of Balraj Madhok, an RSS veteran, about Ambedkar – four decades after his death! It would be naïve to believe in a verbal account of an RSS ideologue about Ambedkar’s view especially when the latter’s own writings are silent on the matter! Prior to this, no print or television media ever cited this quote of Ambedkar on Article 370. Through this article, I challenge all those who have peddled this fake news for more than two decades to present and authenticate documentary evidence of this quote. The third matter which has given me cause, not merely for dissatisfaction but for actual anxiety and even worry, is the foreign policy of the country. Any one, who has followed the course of our foreign policy and along with it the attitude of other countries towards India, could not fail to realize the sudden change that has taken place in their attitude towards us. On 15th of August, 1947 when we began our life as an independent country, there was no country which wished us ill. Every country in the world was our friend. Today, after four years, all our friends have deserted us. We have no friends left. We have alienated ourselves. We are pursuing a lonely furrow with no one even to second our resolutions in the U.N.O. When I think of our foreign policy, I am reminded of what Bismark and Bernard Shaw have said. Bismark has said that “politics is not a game of realizing the ideal. Politics is the game of the possible.” Bernard Shaw not very long ago said that good ideals are good but one must not forget that it is often dangerous to be too good. Our foreign policy is in complete opposition to these words of wisdom uttered by two of the world’s greatest men. How dangerous it has been to us this policy of doing the impossible and of being too good is illustrated by the great drain on our resources made by our military expenditure, by the difficulty of getting food for our starving millions and by difficulty of getting aid for the industrialization of our country. Out of 350 crores of rupees of revenue we raise annually, we spend about Rs. 180 crores of rupees on the Army. It is a colossal expenditure which has hardly any parallel. This colossal expenditure is the direct result of our foreign policy. We have to foot the whole of our Bill for our defence ourselves because we have no friends on which we can depend for help in any emergency that may arise. I have been wondering whether this is the right sort of foreign policy. Clearly, Ambedkar, a staunch democrat and therefore a strong advocate of the right to self-determination is being portrayed as a war-monger or a Sanghi custodian over such a sensitive subject pertaining to one of the longest running conflicts ever. And to peddle the RSS agenda of abrogating Article 370. History may be always written by the victors, and by tyrants. However, in modern times, it must be noted that the subaltern narrative is the alternate mainstream.